"I like the way our company takes care of the employees and, most importantly, our clients. I have worked in three office locations and have had the opportunity to work with a great group of people on many different projects." Rory has conducted surveys in Minnesota, Iowa, North Dakota, South Dakota, Wisconsin, Michigan, and on the Rainy River by Lake of the Woods. Searching for survey markers set more than 100 years ago has always been a favorite part of his job. 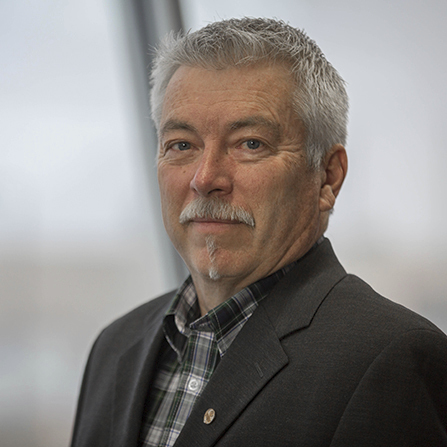 Rory began surveying with Bolton & Menk in 1976 and has performed a variety of surveys, including boundary, topographic, ALTA/ACSM land title surveys, as-built, construction, elevation certificates, Letter of Map Amendments, and engineering design surveys. "I like the way our company takes care of the employees and, most importantly, our clients. I have worked in three office locations and have had the opportunity to work with a great group of people on many different projects," says Rory, who has worked for Bolton & Menk for over four decades. His survey work has led him to fun and interesting places for fishing, trap shooting, and adventure hunts.